I got a call from a lady a few days ago at my home number. Normally I never answer the phone if I don't recognize the number, but this was from my hometown area code, so I thought it could be a friend or family member I didn't recognize. But the lady on the other end asked for a guy that I didn't know, same last name. So in theory, considering my last name isn't Smith or Jones, it could have been a relative, but probably not. I chatted with her a few minutes, as she was trying to find a brother of hers that she got separated with 20 or so years ago. It was his birthday, and since they grew up relatively locally to me, she told me that she calls around the area every year to see if she can locate him. Was a really nice, yet sad story of a sister trying to find a family member, separated for whatever reason. All I could do was wish her luck and told her to let me know when she found him. Something like that ever happen to you? 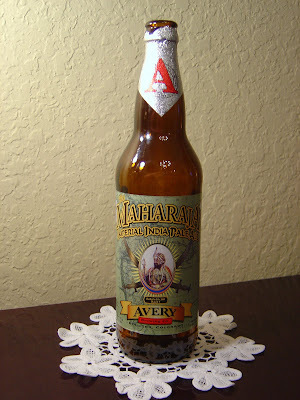 Today I'm drinking The Maharaja Imperial India Pale Ale brewed by Avery Brewing Company in Boulder, Colorado. I've had a few great beers from this brewery, so I'm anticipating another terrific one, especially considering the story of the word origin of Maharaja and how this beer is like that--a great, heavy-handed king and ruler of hops and malts. We'll see. The cool big 22 oz. bottle is a good way to start. (The bottle also says Bottled Feb. 2009 Batch 9 which I'm sure to regret at some point in the future if I don't write that here, so planning ahead). Hey, Maharaja! Extremely hoppy and citrus aroma, with a sweetness as well. Terrific! Powerful grapefruit introduction on your palate, like fresh squeezed. Very crisp and refreshing up front. As the beer progresses, you start to taste some sweetness and malty flavors as well. There is also a definite grassy aspect to this guy. The 10.27% alcohol is so nicely blended with the sweetness and bitterness that I hardly remembered it was there. As the beer develops, however, you certainly do get a warming reminder. This was an awesome beer from start to finish. Hoppy, strong bitter bite, balanced wonderfully. A favorite for sure and at the head of its class.